“Trans-Neptunian object” is a generic term describing all of the assorted objects out beyond Neptune. The first objects known to man that were related to this outer belt of flotsam and jetsam were the comets, although no one actually realized this at the time. Then in 1930, astronomers discovered Pluto, the first object definitely known to orbit out beyond Neptune (although it spends about 30 years of its 248-year orbit inside the orbit of that planet). Since no other objects were known to exist out there, Pluto was considered a planet, just as Ceres had been more than a century earlier. It retained that designation until the later discovery of additional objects forced a reclassification, and in in another repeat of history, in 2006 Pluto was demoted. Today, there are over a thousand known trans-Neptunian objects, and many more are suspected to exist. When discovered, Eris was believed to be the largest of these objects; in fact, it was its discovery that prompted the demotion of Pluto. Today, Pluto is again believed to be the largest, although further observation may someday change that again. Similar kinds of objects have even been detected orbiting other stars. Various classifications have been made to try and divide these objects into groups, based mainly on orbital characteristics. Because of their distance from the Sun, trans-Neptunian objects are very cold. Therefore, a large percentage of their mass is made up of ices, including elements and compounds which are gaseous in the inner solar system. Frozen methane and nitrogen are common. Radiation is believed to play a strong role in modifying the chemistry of surface layers of these objects. 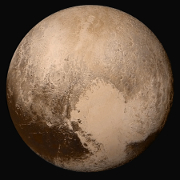 Colors vary from grayish white all the way to red (Pluto is a bright orange-red, for example). Little is known about the physical structure of these objects, whether they have been differentiated into rocky cores surrounded by icy mantles, or are merely “dirty snowballs”, with ice and rock fairly evenly mixed. Almost certainly the smaller members, such as comets, are undifferentiated. On the other hand, there is a good possibility that larger objects, such as Pluto and Eris, are at least somewhat differentiated. Interestingly, a number of these objects have been found to have moons. Eris, Orcus and Quaoar each have a single fairly small satellite. Haumea has two moons, one of which is larger than any of the moons of the other three objects, although still fairly small. Pluto—which has been studied longer than any of the rest—has at least 5 moons, the largest of which, Charon, is actually larger than most of the other trans-Neptunian objects. Before its demotion, Pluto and Charon had often been called a “double planet”, since they are even closer in size than Earth and the Moon. Trans-Neptunian objects are generally divided into two groups: the Kuiper Belt and the scattered disk. Although not usually lumped in with trans-Neptunian objects, there is also the Oort cloud, which lies even further out and is believed to be the source of comets. The Kuiper Belt is similar to the asteroid belt in that it is composed of a large number of relatively small bodies, of which Pluto was the first to be discovered. However, it resides on the outskirts of the solar system, stretching from around the orbit of Neptune out to nearly twice as far. And whereas asteroids are composed of mostly rock and metal, Kuiper Belt objects (KBOs) are composed largely of ices, such as frozen water, ammonia and methane. Resonant Objects, which are KBOs which orbit in either a 2:1 resonance with Neptune (also called twotinos), and those with a 3:2 resonance with Neptune (also called plutinos, after their most massive member, Pluto). Classical Kuiper Belt Objects, which are KBOs whose orbit does not display any kind of resonance with Neptune or any other planetary body. Today, the number of known KBOs has grown to over a thousand, and estimates put the total possible number of objects at over 100,000. The total mass of the Kuiper Belt is anywhere from 20 to 200 times as massive as the asteroid belt. Individual members of the Kuiper Belt are correspondingly larger than their counterparts in the asteroid belt. The largest member, Pluto, is nearly two and a half times the diameter of Ceres, the biggest asteroid. 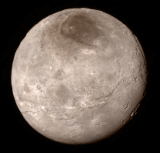 Even Pluto's largest moon, Charon, is bigger than Ceres. The scattered disk is much less well defined than the Kuiper Belt. It consists of objects—mostly out beyond the Belt—with eccentric orbits that take them close enough to Neptune for that planet to affect their motions. Although fewer scattered disk objects have been discovered than KBOs (a little more than 200), astronomers believe that ultimately there are at least as many. The largest scattered disk object is currently believed to be Eris. When discovered in January of 2005, it was at first believed to be significantly larger than Pluto. Later, that was reduced to slightly larger, and following the New Horizons flyby (see section below on Exploration), it was demoted to second place among trans-Neptunian objects. It was the discovery of an object believed to be larger than Pluto that forced the International Astronomical Union to make a decision, and in the end they (properly!) demoted Pluto and thus formally recognized the true nature of the trans-Neptunian objects as a group, analogous to the asteroid belt. Eris was originally dubbed “Xena” by its discoverers, before the IAU got around to giving it a real name. Eris has one small moon, named Dysnomia. Unlike some other objects such as Pluto or Sedna, Eris is not red, and is highly reflective. Indeed, it is the second most reflective body known in the solar system, right after Saturn's moon Enceladus. Sedna is another body often considered a scattered disk object, yet that designation is in question, since it never comes anywhere near the orbit of Neptune. Right now it is slightly closer to the Sun than Eris, but its highly elliptical orbit will eventually take it several times further out. Another designation, detached object, is sometimes used to describe Sedna and similar objects. 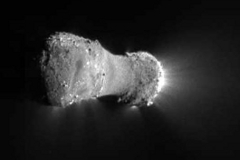 Certain classes of short term comets are believed to originally come from the scattered disk. At this point in time, the Oort cloud is still essentially theoretical. It is postulated to lie at a distance of nearly a light year from the Sun, as a vast sphere of icy objects on the very edge of the Sun's gravitational influence. Another hypothetical cloud, the Hills cloud, is believed to lie further inward toward the Sun, and have the form of a disk in the plane of the ecliptic. Most likely, the two clouds would not have a distinct boundary, but would merge into one another. Long term comets and certain classes of short term comets are believed to originate in the Oort/Hills cloud, as gravitational influences of nearby stars and possible passing objects disturb the orbits of individual members. It is also postulated that there still might be more planets out beyond the Kuiper Belt and scattered disk which could also serve to disrupt the orbits of Oort cloud (and scattered disk) members. Estimates range from a planet or planets the side of Earth all the way up to the size of Jupiter. Such planets would be very difficult to detect, since their motion across the sky would be extremely slow, and because of the very low light levels that far from the Sun. Four probes to the outer planets—Pioneer 10, Pioneer 11, Voyager 1 and Voyager 2—have traveled at least partway through this belt. Voyager 1 is the furthest man-made object from the Sun, and has actually passed beyond the orbits of Eris and Sedna. None of these probes have passed close enough to any trans-Neptunian object to study it. In January of 2006, New Horizons was launched, with the goal of reaching Pluto in July of 2015. A year later it took some of the highest resolution pictures ever of Jupiter, using a camera that had been designed for much lower light levels. On July 14, 2015, it flew past Pluto, becoming the first probe to ever visit one of these objects. During the flyby, New Horizona not only imaged Pluto and its moons, but made many other observations as well. Because of the great distance involved, limited on-board power and slow data transfer rate of only around 4 kBps, it took nearly 16 months to transmit the multiple gigabytes of data to Earth. During the flyby, the probe snapped many close-up pictures, revealing features such as an irregularly heart-shaped smooth region, mountain ranges, and an atmospheric haze that extends up to 130 kilometers above the surface. This exceedingly thin (around 100,000 times less dense than Earth's) atmosphere is composed mainly of nitrogen, with smaller quantities of methane and carbon monoxide. Both are in equilibrium with their respective ices on the surface. Most of the surface of Pluto is covered with nitrogen ice. Because the orbit of Pluto is fairly eccentric, this atmosphere probably disappears almost entirely when it is furthest from the sun. Pluto's reddish-orange color probably comes from chemical changes on the surface caused by cosmic radiation and ultraviolet light. The color varies considerably depending on location, and in some regions is nearly coal-black. There is also a difference in types of surface ice; the hemisphere facing the large moon Charon has more methane ice, whereas nitrogen and carbon monoxide ice are more prevalent on the opposite side. Three and a half years later, on January 1, 2019, New Horizons flew past 2014 MU69, also know as "Ultima Thule". This object lies nearly 1.6 billion kilometers further from the sun than Pluto, and takes nearly 300 years to complete one orbit. During this flyby—the furthest ever from Earth—New Horizons snapped many pictures and probed the object with its instruments. The small Kuiper Belt object turned out to be composed of two distinct lobes, with an overall length of 34 kilometers. At first, scientists thought that both lobes were spherical. However, examination of other images taken as New Horizons passed Ultima Thule revealed that the larger lobe is very flattened, resembling a hamburger patty. Overall, Ultima Thule has a reddish color, but is not as deeply red as Pluto. The origin of the red coloration is probably the same, though. At this time, New Horizons is still traveling through the Kuiper Belt, transmitting data back from the 2014 MU69 encounter. Mission controllers are considering the possibility of yet another flyby, but at the time of this article, no object has been chosen.